With a dash of cinnamon or a sprinkle of sugar, the apple is the favored fruit for fall. Would you like to smell the aroma of nutmeg, cinnamon and apples baking in your kitchen? These apple recipes will show you some of the sweetest ways to enjoy the autumn season. Memories of fall always include caramel and apples. 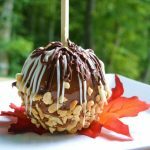 A big golden delicious apple on a stick covered with sweet chewy caramel and peanuts is just one of three apple-delicious recipes that you can make this season for your family and friends. Have you had problems with caramel staying on the apple after you dipped them? This homemade caramel recipe and ways to prepare your apples will keep your caramel from slipping off. Now you can make gourmet caramel apples with loads of caramel, chocolate, and various toppings without the caramel pooling at the bottom of the pan. Caramel Apple Walnut Cookies are individual mini pies filled with a layer of caramel and thick homemade apple pie filling. The cookie is topped with a pie crust woven lattice that resembles an apple pie. As you bite into this little bit-of- heaven, the apple filling with its cinnamon and walnut bites ooze from the sides of the cookies. The cookie top is sprinkled with a generous amount of cinnamon and sugar. Another Favorite is the apple pie, but this time it is baked like grama use to make it, in a cast iron skillet. 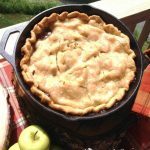 What makes this pie special is the caramel layer in the bottom of the skillet before you add the pie crust and filling. The caramel bakes through the two-layer crusts and rises to the top of the pie making this pie, caramel apple-delicious all the way through. 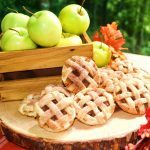 Apple treats are comforting desserts that should make a regular appearance at your fall get-together’s and meals. The sweet scents of apples and cinnamon baking in your oven will make your home cozy, warm and inviting. Decorating with apples is an inexpensive way to create pretty tablescapes and fall décor for your home. October harvest brings bushels of apples and plenty of apple and caramel-infused desserts. Surprise your kiddos with an after school snack and bake a batch of Caramel Apple Walnut Cookies. For the upcoming harvest party, dip and design Caramel Apples. For supper tonight bake a little bit –of- happiness with the Skillet Caramel Apple Pie. Don’t skip the vanilla ice cream on the warm pie. It is truly apple-delicious! 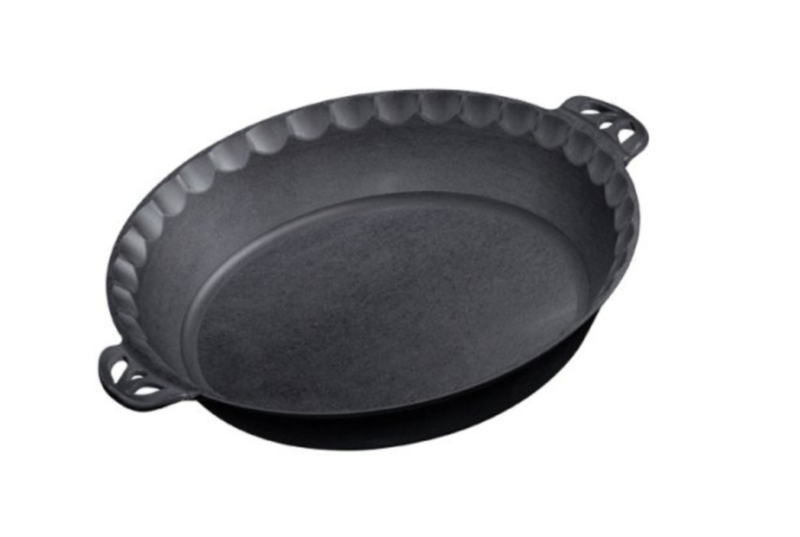 If you don’t have a Cast Iron Skillet, try this wonderful Cast Iron Pie Plate.. it is priced at 12.00 and you will use it over and over again. Click here to order. In 10 “ cast iron skillet, over medium heat, melt 6 tablespoons butter, brown sugar, corn syrup, and 1 teaspoon salt. Stir caramel mixture together until smooth and bubbly around the edges of the skillet. Add walnuts stir to combine. Remove from heat and cool 10 minutes. Meanwhile, in a large bowl, add apples, flour, sugar, and spices, mix to coat apples. Unroll one crust and place on top of caramel –walnut mixture in skillet. Pushing the crust up the sides of the skillet. Add coated apples and 2 tablespoons of butter diced into small pieces. Unroll remaining crust and place over the apple pie filing. Pinch and crimp both crust edges together. Brush top of crust with egg wash and sprinkle with granulated sugar. Bake pie on a parchment lined baking sheet for 55-60 minutes at 350 degrees. Serve warm with vanilla ice cream drizzled with caramel sauce if desired. Prepare apple toppings and place in bowls, set aside. With 4 tablespoons of butter grease parchment paper or wax paper, set aside. Remove wax on apples by placing apples in boiling water for 40 seconds, remove and rinse. Dry apples, remove apple stems and add sticks. In large saucepan on medium heat, melt butter, sugars and corn syrup until smooth, but not boiling. Add condensed milk and stir with wooden spoon until candy thermometer reaches 178 degrees. To dip apples; make sure apples are completely dry. Dip apple in caramel and allow caramel to drop off the bottom so it will not pool, roll apple in desired toppings, place on buttered wax or parchment paper to set. Melt white bark and chocolate chips in separate containers and place in individual disposable piping bags. Pipe white bark and chocolate around tops of apples in a drizzle design. Tip: Apples must be completely dry before dipping. Chilling the apples prior to dipping in caramel will help the caramel harden. On medium heat, cook apples until soft and thickened. Remove from heat and cool. Unroll one crust, using a 2 ½” round cookie cutter, cut out 12 cookie rounds. Place rounds on a parchment lined baking sheet. Brush tops of pie crust cookies with caramel topping. Add a ½ teaspoon apple filling over top of cookie round. Sprinkle with chopped nuts if desired. Unroll remaining crust and cut long strips of dough ¼ “ wide. Weave dough strips to create a lattice design. Cut cookie lattice with round cookie cutter to create clean edges. Mix ¼ cup sugar and 1 teaspoon ground cinnamon and nutmeg Brush tops with egg wash and sprinkle with cinnamon and sugar mixture. Bake cookies for 30 minutes at 350. Drizzle cookies with caramel sauce if desired. Best served warm.